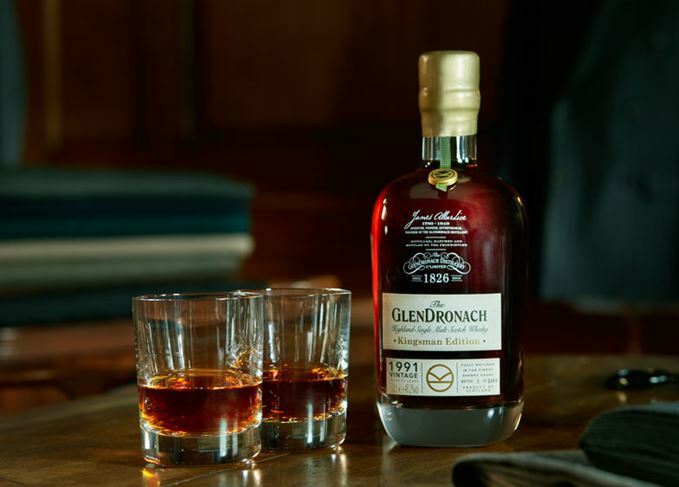 GlenDronach distillery has partnered with film studio 20th Century Fox to launch a limited edition single malt Scotch whisky marking the release of Kingsman: The Golden Circle. The film, due for release in UK cinemas on 20 September, is the sequel to 2014’s spy action-comedy Kingsman: The Secret Service, and stars Colin Firth, Taron Egerton and Channing Tatum. The Kingsman sequel sees Eggsy (played by Egerton) enlist the help of an allied US spy organisation called Statesman, after the Kingsman’s London headquarters is destroyed. The Statesman, who are based in Louisville, Kentucky, disguise themselves as a master distillers to mask their identities. To mark the film’s release, GlenDronach master blender Rachel Barrie partnered with Kingsman director Matthew Vaughn to create a 1991 Sherry cask-matured GlenDronach, bottled at 48.2% abv. ‘I selected the 1991 vintage as it marks birth year of “Eggsy”, who is also known as Kingsman agent Galahad,’ said Vaughn. Each of the 2,000 bottles produced are individually numbered and signed by both Barrie and Vaughn. The GlenDronach Kingsman Edition, which features in the film, will be available from selected retailers in the UK, EU, North America and Asia from September for around £550 a bottle.